JGarden Description: This garden is located in a quiet section of the Carleton campus. It's known for its grace, human scale, and contemplative atmosphere. 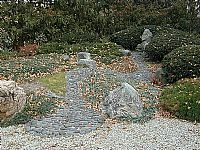 It was was conceived by Bardwell Smith, the John W. Nason Professor Emeritus of Asian Studies at Carleton and designed and constructed by David Slawson, author of Secret Teachings in the Art of Japanese Gardens. It continues to be maintained by Slawson and Mary Bigelow, a professional gardener from the University of Minnesota Landscape Arboretum. This garden was named one of the 10 best in North America by the Journal of Japanese Gardening.